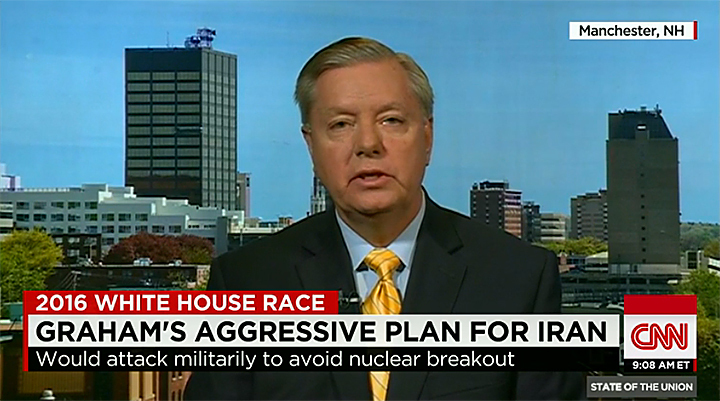 Republican presidential candidate U.S. Sen. Lindsey Graham appeared on CNN’s “State of the Union” this morning from Manchester, NH, where he discussed the latest on the Iran nuclear negotiations and his 2016 presidential run. He said, if the U.S. can’t convince Iran to end its program peacefully and the mullahs attempt to “breakout,” he said he would stop them, as president. The “worst possible nightmare for the world at large” is a nuclear Iran, he added. 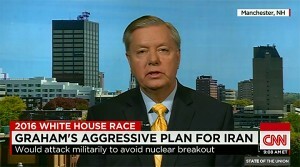 Graham later said he thinks leaving the interim deal with Iran in place was a “good deal” and applauded Secretary of State John Kerry. However, he also said, with the exception of U.S. Sen. Rand Paul, all of the other presidential candidates — he didn’t clarify if he only meant Republicans or if he included Democrats, as well — could negotiate a better deal than the Obama Administration.